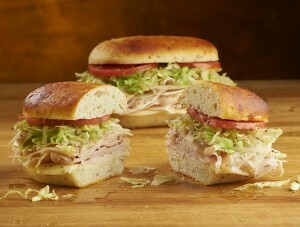 Gluten-Free Living > Blog > News > Jersey Mike’s Subs Is On a Gluten-Free Roll! Jersey Mike’s Subs Is On a Gluten-Free Roll! Jersey Mike’s, the rapidly growing sandwich-shop chain, is looking to broaden its customer base by offering gluten-free rolls. Philadelphians call their long, stacked sandwiches “hoagies.” Maybe you know them as “grinders” or “heroes.” At the Jersey Shore, where Jersey Mike’s started in 1971, they’re “subs.” Whatever the name, the rapidly growing sandwich-shop chain, with 1,200 stores in 44 states, is looking to broaden its customer base by offering gluten-free sandwich rolls. In 2014, Jersey Mike’s began testing gluten-free rolls made by Udi’s at locations in southern Florida and, more recently, in Los Angeles, said Michael Manzo, the company’s Chief Operating Officer. This month, Jersey Mike’s expanded its pilot program to 63 stores in New Jersey and the New York and Philadelphia metropolitan areas using rolls made by Colorado’s gluten-free Wild Flour Bakery. That test is slated to run through April 2017. “We hear from former sub lovers who are now gluten free that they miss their Jersey Mike’s subs as well as from those who have never eaten a sub sandwich,” said Jersey Mike’s President Hoyt Jones. Manzo added that the idea of offering gluten-free rolls came from a franchisee whose daughter has celiac disease. While Manzo has been encouraged by customer response to the Udi’s test, he said that Jersey’s Mike’s CEO, Peter Cancro, pushed the company’s development team to pursue a bread that they could bake in the stores themselves. Wild Flour’s yeast-raised Tuscan Herb sandwich rolls, unique to Jersey Mike’s, arrive as dough and are proofed and baked fresh each day. The gluten-free roll size is equivalent to a traditional mini size, according to Manzo. There is a $2 surcharge for the gluten-free option. The restaurants have dedicated pans for baking the rolls, and store employees wear new gloves when handling the rolls and use knives and other utensils that haven’t touched other bread products when slicing the gluten-free rolls. The gluten-free sandwiches are prepared on parchment paper so that there is no contact with the prep-area counter. Customers can request that toppings such as lettuce, tomatoes and onions be taken from stock in the stores’ walk-in refrigerators. Manzo said that the absence of loose flour in the stores’ kitchens and the custom slicing of cold cuts, all of which are gluten free, boosted the company’s confidence to offer sandwiches to those with celiac disease. According to Manzo, company executives will evaluate sales data, customer comments and employee feedback during the testing phase and determine whether to offer a gluten-free roll option beyond the current regions. If the program is expanded, he said, it would likely be on a state-by-state basis rather than an immediate nationwide rollout.